Somewhere City collection is a new set of mix and matchable fantasy characters of Goran Lelas for StrangeCo. It is said that “Somewhere City is everywhere and nowhere, floating from one part of the planet to another. Its motion is fueled by the “Secret Thought” of its wonderful, positive inhabitants.” Cryptic? Yes. Playfully adorable, and even more so when mixed up? Also, yes. While this first series launches in plastic ~ we’ve also got a sneak peak at the upcoming plush incarnations (probably available around Q1 2008)… which i think are perfect for baby gifts! 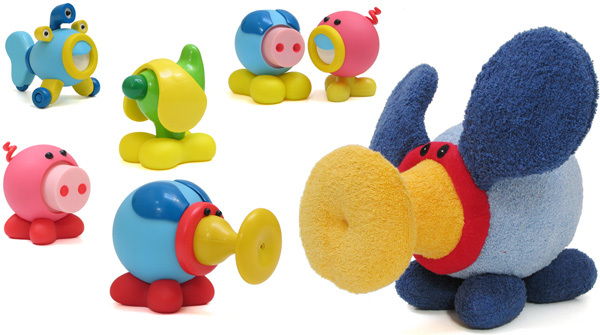 I wonder if they rattle or honk ~ doesn’t the yellow bill/mouth/nose thing look like you should squeeze the body and some initially adorable but quickly annoying noise should come out? See more pictures of the whole collection and more mixups below! Also noteworthy ~ it seems that MoMA is getting into the toy business, this collection was developed in collaboration with them, and will also be in their stores for the holiday season! And Goran Lelas is apparently an “accomplished designer whose magical style spans fashion, illustration, children’s literature and costume design” and this is his first foray into toy design. 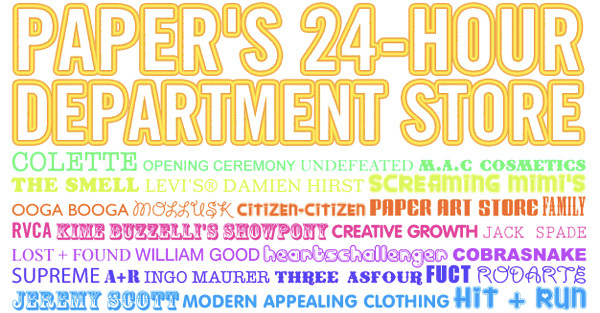 I just returned from the insanity that is Paper’s freshly opened 24 hour Department Store on La Brea (it runs from 6pm Friday through 6pm Saturday)… really its like a one day only pop-up mall. It is a hot hipsterfest of a shopping party with Andrew Andrew keeping everyone dance/shopping from within their post-it dj booth~ with a red room of MAC makeover portraits (even frame yourself in gold) ~ and a Levis photoshoot of you in your fav 501s. My favorite stores and finds of the night? The Undefeated Limited Ed. Spalding Ball that was on .org… Colette has great textual ribbons, particularly the black and white “Everything you see is a dream you project onto the world”… Jack Spade! Citizen:Citizen! A+R! Mollusk! See below for images of the whole wild experience… and don’t forget, LA kids, you still have time to make it over. So continuing from where the last post lead us (from Triops and Sea Monkeys to venus fly traps and praying mantis to ant farms to gel antfarms and gel plant kits)… the gels. So as we began to read into the variations of these gel ant farms and also being able to watch seeds grow roots in this magical mystery gel, we got really curious and wanted to find just the gel (imagine what you could design with it). And along the way we remembered the plant water gel crystals that soak up tons of water that you can grow plants in. The only problem with those was can you crush them up, mix with warm water, and mold it to be smooth like jello? (we don’t know, do you?) Then we also discovered jello pudding cup like 6 packs of root gel… and than i finally tracked down some manufacturers in china that actually sell the magical ant farm gel (and ant farms in hills and boots ~ see pictures below to make sense of that). Also did you know some people are using this same gel for dieting?!?!?! You eat it, then drink a ton of water which it will soak up, and it will make you feel full? I’m not really a halloween girl. There i said it. It’s really just not my holiday ~ however of all the halloween design i’ve been seeing (and the most has been showing up on TasteSpotting) ~ when i saw these bat clothes pins over at MocoLoco i couldn’t help but smile. The Art Lebedev crew looked to solve: Problem. Do something before October 31st. Solution? 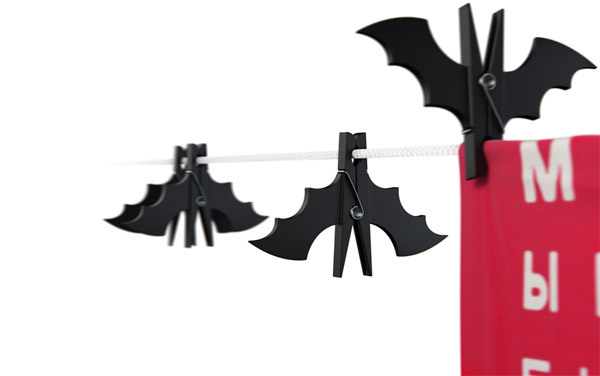 Inexpensive plastic Vespertilium clothes-pegs remind your neighbors that your laundry is Halloween-ready. Brilliant. Plan Toys ~ more woody toys to play with! Noticed the water and sand blocks at Swiss Miss and went exploring Plan Toys further… turns out they have quite the variety of wooden toys, from doll houses with various decor accessories, life size play houses (with microwaves and dish washers), building toys, push/pull toys, pirate sets, build your own 2D to 3D dinos, and even mini woody foosball! The one that stood out most to me at first ~ how cute are those living room, bathroom, patio sets above? Love that they even have a flat panel TV. See more of my favorites below. Ok with all these reusable bags floating around… from designer ones to simple ones to crazy patterned ones… here’s a quick little review from what all of us at NOTCOT have learned so far… and what we love, and don’t love… when we use them, and when we don’t. Would love to hear what you do with them as well, and what kinds of things drive you nuts about them. Because with a simple project brief like “design a new superusable reusable grocery bag”… it seems strange that most of the solutions seem like nylon versions of things from the past. What advances could we add to them? What little details would you love to see in a reusable grocery bag? Are reusable grocery bags the new t-shirt? The next thing everyone needs a drawer full of ~ in every color and design for every mood and occasion? Baggu Bags. These clean simple bags sure are getting popular lately! They’ve been on most of the design/trend blogs, and we’ve even had them on NotCouture when we first launched - they are #478. Dan and i had the pleasure of having coffee with founder Emily Sugihara last week (she’s freshly relocated back to California, and is testing out the norcal lifestyle) ~ and we all got on so well it ended up being a few hour long “quick coffee”… she’s an adorable, fascinating, fellow 24 year old ~ grew up in Del Mar ~ put in time at Parsons getting a masters in Fashion ~ interned with Proenza Schouler, worked at jcrew, bebe, etc… and then finally realized it was time for a change. So putting her keen fashion design skills to work on something a bit more everyday ~ she and her mother have taken on the reusable grocery bag market ~ not only helping make our grocery shopping a bit more clean and brand-free, but also help cut down on all the plastic we’ve been using ~ also she and i are on the same page that having a home/wherever you are office, is far more fun than a traditional day job! I know, i’ve been ranting lately that there are SO MANY options, and it feels like people have suddenly “discovered” the concept of reusable bags… but these are pretty slick and understated (finally! )… and for the gents ~ her folding design actually does fit in a guys tight jean back pocket. 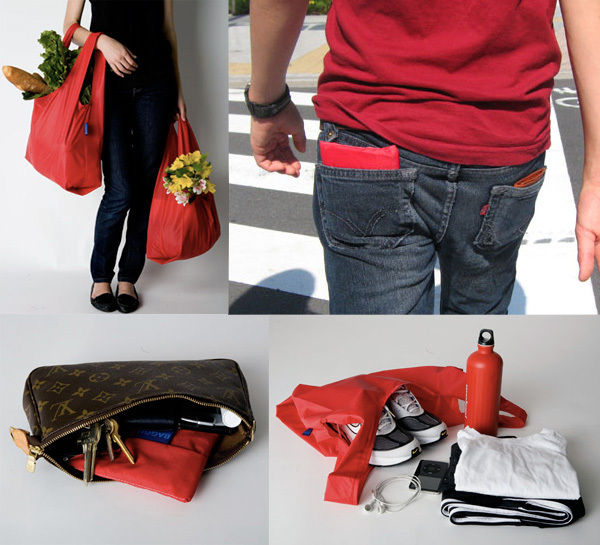 So no more excuses for the non-purse toting ones. I have a hands on review/comparison post coming up next, but just wanted to let you guys know how fun our meeting was first! Also ~ any interest if we were to team up and do some limited edition understated NOTCOT designed Baggus? Wow. I’m glad i don’t have kids of my own this holiday season… because between these new Muji Woody nature inspired toys and the ikea ones i recently posted… they are so adorably well designs and well priced, my whole floor would be covered in these things! (Although, how fun would it be to run a preschool with only designer goods? It would be a fun way to set the standard extra high for all these kids from day one!). So here we have everything from wood DIY Dodos (my fav), blue whale, turtle, mammoth… a chalkboard globe! Woody hedgehogs… a zoo in a bag! (every executives desk clearly needs this)… and even an evolutionary puzzle to learn from. More images and more toys below. 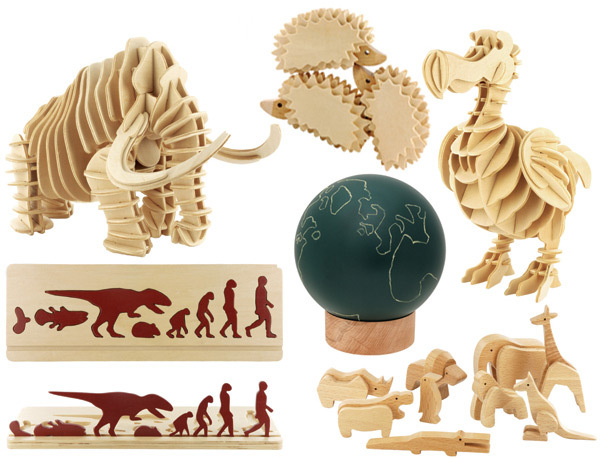 There are some great toys over at IKEA that make me wish i was 2-3 again ~ their wooden toys are a great price (only 7.99!) and really fun minimal designs that would look great in any studio (and playroom?). Today Shade Elaine and i were wandering through the zoo of an IKEA in Palo Alto and ended up taking far too many pictures of brilliant and hilarious things we found (many of which we hadn’t seen in the catalog). 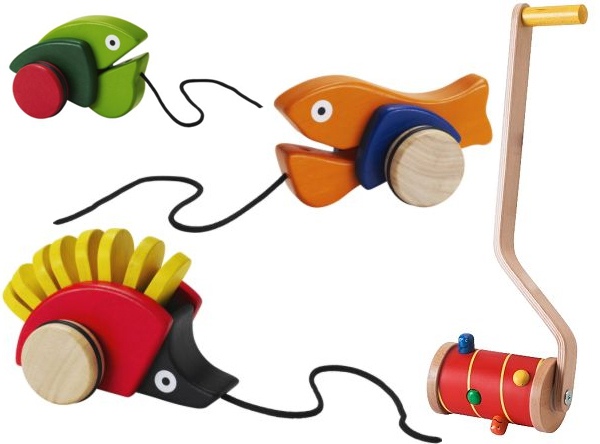 So starting with our absolute favorites… here are the three “KLAPPARs” pull toys (FISK - fish, GRODA - frog, IGELKOTT - hedgehog) and the MULA pull toy where these little heads pop up with various faces as you roll along. Please excuse the mediocre images, but i was feeling silly and didn’t really expect to post about the trip, so all pictures were taken with my pearl… but below there are pictures of these toys in the wild, crazy halloween masks (and the masks on giant suspended stuffed dragons), what appears to be a drunken beer bellied fox and its crazed baby/mini, some angry pill bug bags(? ), nice new metal dog bowls, cute graduated cylindars (apparently dishwasher safe although so so thin), and fun acrylic sheet cut in the shape of a lamp and lightbulb with an LED. Is this a bad reason to order more buttons? And design some new TasteSpotting and NotCouture ones to go with the NOTCOT two? I was just browsing the portfolio of Also ~ who are getting a lot of attention this week for having designed Design*Sponge’s new site! And noticed they did all the Busy Beaver animations as well ~ not to mention this incredible packing tape! And i’m kicking myself for not having ordered enough to have it shipped in a box so they could tape it up… (i only got an envelope of 1000 - and not even the really cute envelope below!) Its absolutely brilliant how you give these crazy buttons haircuts when you open the package! Ready for possibly one of my most ridiculous posts ever? (And my excuse of the moment is, i’m having some personal issues, so i’m coping by doing silly things like this). So remember the Staples Easy Button? I posted it about it back in December 2005… and i’m assuming that thanks to unintentional SEO, all those crazy comments of people discussing how to hack it (to become a garage door opener, make circus noises, etc) came from random searches. Well i never knew there were Staples Boton Facils too! But what really kicked this whole thing off was i was wandering around Yahoo Campus after the Company Store had already closed, and upon peering in the window i saw these INSTA-YODEL buttons, and HAD to have one. So i went back this morning to get one of those, and naturally needed to go grab the Staples one too (i had no idea there were facil buttons until i showed up). Anyhow, more pictures below, and i even made a silly little VIDEO (because these buttons, as cool as they are, are meaningless without hearing them all)… and a mini rant on the design of these button options. They will gift wrap” your jewelry in a plaster heart, painted whatever color you desire (silver, gold, black, red, pink, etc)… and upon receipt the recipient has to break the heart to get their gift… doesn’t it really feel more like a prize at that point? Or like the grown up version of those toy in the plastic eggs from the machines? And i love how this makes you rethink about the concept of the giftwrap as you open it as well… forcing upon you the idea that (unlike wrapping paper or those plastic eggs) this is a no return kind of move… you’ll never have that heart again? Anyhow, i love the idea of how this changes the gift receiving experience! Ninja Town! 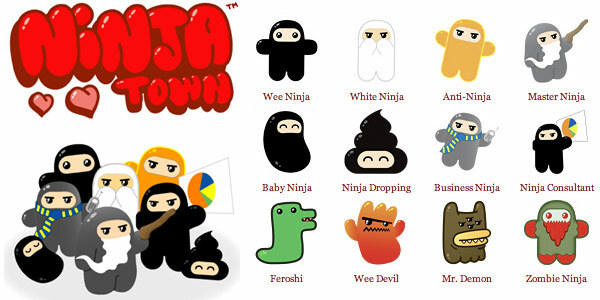 The Wee Ninja’s of Shawnimals have come a LONG WAY since we first started writing about them. [You can see all the posts here]… apparently they are now well on their way to becoming a Wii Ninja (ok ok, i couldn’t resist)… but they have a Ninja Town game coming out for Nintendo DS soon! (Trailer below!) And even more incredible… look at this cast! I can’t stop laughing from the description of the Ninja Consultant… yes, he has one arm. And “For a fee, with powerpoint presentations and flow charts in tow he’ll show you ways to make your business process more efficient by using side steps, smoke bombs and stealth hugs.” The new Ninja Town site is now up, with bios, icons, wallpapers, etc. And more images below as well for you. Coudal Partners has teamed up with Draplin Design Company of Portland to bring you Field Notes Brand Notebooks… and the first batch has been shipped out this week! “We just wanted people who had shown an interest to be able to pre-order our initial Field Notes product, a durable made-in-the-USA notebook inspired by vintage farmers’ planting books and other practical, historic, mostly-midwestern American design.” They are also 3 for $9.95. I don’t know about you, but Moleskine are getting a bit played out, although these do pretty closely resemble the Moleskine Cahier Journals (also in three packs, similar look)… these are pretty fun (loving the font, naturally). Spotted these over at Notebookism. And for one of the first pics in the wild, see below.